A Food allergy is an immune system response to a substance found in food that is normally harmless. Certain immune responses see the food substance and attacks it in the same way our immune system attacks bacteria and viruses. While it’s a devastating diagnosis, there is promise for the future. New treatments are being studied, and do look promising for kids with peanut allergies, but there is still along way to go. A child who is allergic to peanuts, does not necessarily have an allergy to tree-nuts (almonds, cashews, or walnuts). However about 25-40% of them are allergic to both, and many physicians will recommend avoiding both. The best practice as a parent you can be in is to read your labels. Checking labels for the allergen itself, as well as cross contamination of the allergen is vital for allergy management. Then, if your child is in school, inform the teacher, as well as the front office about your child’s allergy. From my experience, teachers are great about protecting your child and informing the rest of the parents that may bring food into the class about the allergy. This helps to control their environment for contamination they may not see or even ingest. Secondly, it’s very important as well to teach your kids to be their own advocates and know what foods are safe for them. From a very young age, they can question the source of their food when other safety barriers have broken down. 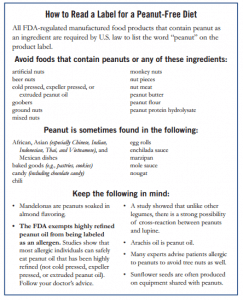 For a complete list of what to check for on a label, whether you have a peanut or tree-nut allergy, print this document! from Food Allergy.org It’s very simple and comprehensive, plus it contains helpful label reading information for other allergies. Mix all ingredients and press into greased pan, 9X13. Dough will be VERY dry and crumbly. It’s OK, it will still turn out. Press until dough forms with pan. Bake at 325 for 20 minutes or until edges are browned. Take out and let cool entirely. Cut into strips and store in snack size bags. Optional: Drizzle melted chocolate over the top. Gluten Free sub for whole wheat flour? Jessica- You could try oat flour! just take some extra oats and put them in a blender until you have 1 cup of oat flour. Let me know if you try it!! Any substitute for coconut sugar? Could we throw some sunflower seed butter in these to moisten them up a bit? My son has nut allergies (among many others), and I tend to replace peanut butter with sunflower butter in recipes. Maybe in place of the coconut oil? @Kendra- you can use any sugar.. I make it with brown sugar all the time. @nicole- it’s actually pretty moist to begin with! You can leave out the coconut oil altogether and it won’t be a problem. I’ve done it many times. What about adding chia seeds? 1-2 tbsp? @toni- glad you tried it already! That is actually not true. Coconut is not a botanical nut but a fruit. Most people can safely tolerate as long I. There is not cross contamination. Please provide a link to explain this statement. My allergist and nutritionist both have cleared coconut as ok for nut/peanut allergies. It is true. When my daughter was first diagnosed, we were told it was severe enough that we should stay away from coconut. That was ten years ago. Two years ago, she wanted to be tested to confirm. Sure enough, she is allergic to coconut. It is heavily debated whether it is a nut or not…allergist are also concerned about the bucket effect when it comes to coconut. Rolled oats or will steel cut woRk? Maggie- Rolled or quick oats is best. I wouldn’t use steel cut. Could you use rice flour instead of whole wheat flour? 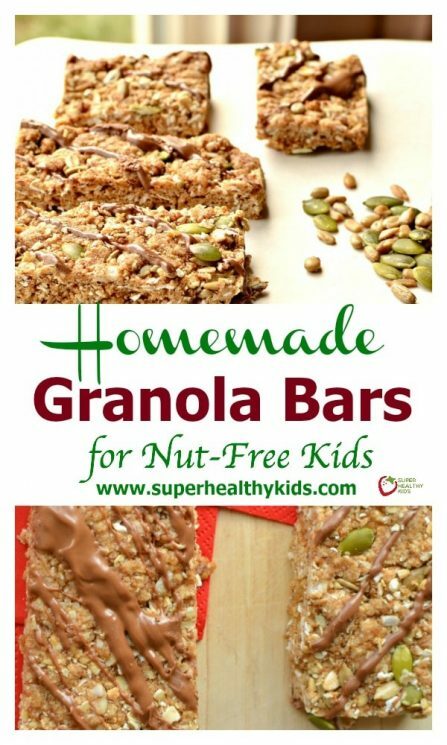 Making items like this for my peanut allergic child is a huge challenge, because it’s proven impossible to find things like sunflower seeds or pumpkin seeds that are processed in a peanut free environment, and we obviously can’t buy them in bulk stores either due to cross contamination issues there. Can you provide a brand name for these? The most popular US brand (gerb’s) isn’t available in my country (Canada). Even finding raw tree nuts that are peanut safe is impossible. Also, Coconut is not a nut, botanically, so just fine for children who aren’t allergic to it specifically. I find that most adults understand not to give my child peanuts but give no thought to cross contamination or the supply chain for ingredients. Here is my issue. My daughter has a TREE NUT allergy & a COCONUT allergy. . .which I am told are two unrelated allergies, but in any case I can’t use coconut anything. I struggle to find healthy recipes which she can eat along with my other girls? I also struggle to find any information on suitable substitutes when these types of ingredients are called for that won’t change the recipe? I am in the same boat! Let me know if you find good recipes! Oh Karen- that is definitely a challenge. I honestly don’t have many resources for you. @Rachel- I’ve never tried it with rice flour. I am not even sure how to use it. I will be making a lot of these for my boys, but I am on a tight budget. Is there a substitute for the honey or at lease some of it? Raw organic honey is a bit pricey here. Karrie- Agave is a bit cheaper here. You can try that for an equal substitution. My allergist said that coconut is a separate reaction, as they are not technically nuts (they are seeds). The nutritionist at Stanford University that I consulted agreed. This recipe looks great. Thank you for providing the alternative and the resource sheet/website. Can you give an estimate of the shelf life for these? Thanks again! Would these freeze well? Thank you for the great recipe! What can I substitute the oats and the wheat flour for? My daughter can’t have gluten and oats are not gluten free here in australia. Thx. I used oat flour instead of whole wheat flour and they didnt hold. Turned out more like a crumble. Great on yogurt. Would the wheat flour hold it together better? The flavor is great though. Can these be frozen and thawed when ready to use? I’ve actually never frozen granola bars Nicole. But if others can be frozen, these should as well. Lisa- have you tried quinoa flakes? That could work!? Jeanne- I wouldn’t’ keep them longer than a week. 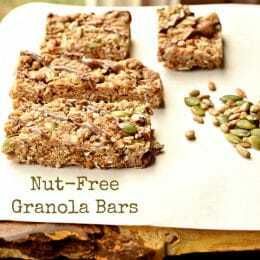 Your recipe is NOT NUT FREE because you are using coconut products (oil & sugar) which are considered tree nuts. A great little story book that can help children and their friends learn about food allergies is called “Marty’s Nut Free Party” by Katrina Roe. It’s about a little monkey named Marty who is allergic to peanuts and how his friends help him to not miss out on the fun. Could Stevia replace the coconut sugar (I don’t buy)… How about olive oil instead of coconut oil? Thanks!!! Recipe sounds yummy!!! I haven’t tried those, but if I were to make changes, I would really just use regular sugar to replace the coconut sugar and grapeseed oil to replace the coconut oil. In the oven! Modified: no seeds, added chocolate chips and chia. Wish me luck! I have 2 picky eaters that only like to eat from packages! How did it go Sara? Amazing! My daughter loves them! Thank you so much! Could maple syrup be used in place of the honey for a different flavor? Jen, I’d love to hear if you try it. I haven’t yet. Do you use raw sunflowers seeds and raw pumpkin seeds, or roasted? Just want to be sure so it’s not over-salted. Thanks! Bekah- I’ve used both, and I didn’t think the roasted ones made the bars too salty. But it works with raw as well. Just thought I’d let you know, I’ve just made these, replacing honey with rice syrup (cheaper) and they are delicious! A little sweeter than I want to give my toddler, so will try cutting back on the sugar next time I think. But yum! Hi Johanna- we have some rice syrup. Will have to try that next time. Just tried these tonight and love them. I followed the original recipe except I cut back on the sugar and added some sesame seeds as well. I have a question about the raw honey part: aren’t the enzymes of raw honey destroyed by baking, making it not much better than processed honey? Cuz if this is the case, it would probably make more sense to use regular honey since it’s not as expensive. I did use raw honey cuz I didn’t have another kind in the house, but just wondering, for the next time I make these. And there will surely be a next time. Honestly Iuliana- I actually use regular honey because of the price. Some people however like the fact that raw honey is less processed and not pasteurized. This was way too sweet. Next time I will leave out the coconut sugar altogether and just use the honey. I made these gluten-free by using quinoa flakes instead of oats and used mostly sorghum flour and a bit of tapioca flour in place of the wheat flour. They were yummy! I did find them a little too sweet for my tastes. I would reduce or eliminate the coconut sugar next time. Thanks for the recipe, I’m sending them for school lunches today!! 68g of sugar per serving? 19g of fat? 676 cal? Is this for real? 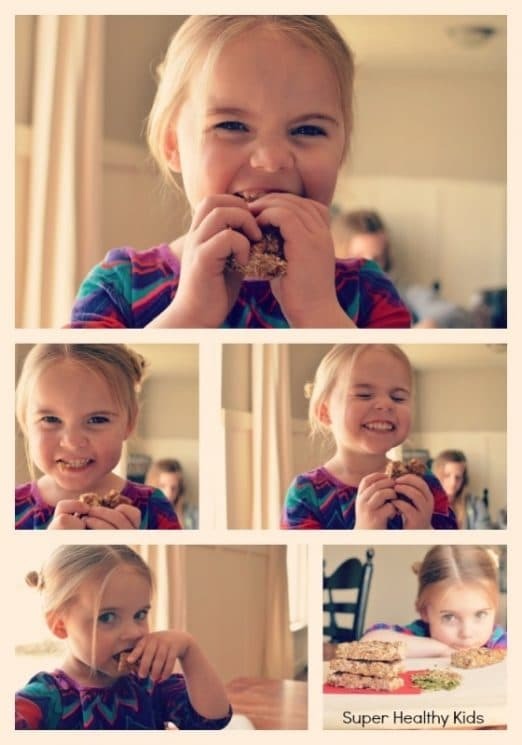 This is an anything-but-healthy kid snack! Tell me this is a mistake, please! Hi Laura! Thanks for bringing this to our attention! We failed to put in the correct number of servings for this recipe, so the numbers were based on our system’s default. I have fixed it and the numbers should be a little more appealing. Have a great day! 22g of sugar is not healthy! Shame! Mama indulgences blog has copied this recipe word for word and is claiming it as her own. This recipe is like a mean joke. The end product is powder dry. After baking, I had to literally add wet ingredients to revive and bake it over again. Don’t make this. It’s a waste of perfectly good food and time. I wish I scrolled down further to see this comment. I knew this recipe was going to be dry so I added 1/4 cup of butter and tried to trust the warning that dry is fine. Well it’s not, it’s falling apart. Too much salt too. Disappointed. I should of trusted my instincts and add some water and less salt. me again, I’ve come back to use this recipe again because it made the best crumble topping for yoghurt. Please be careful with this recipe. 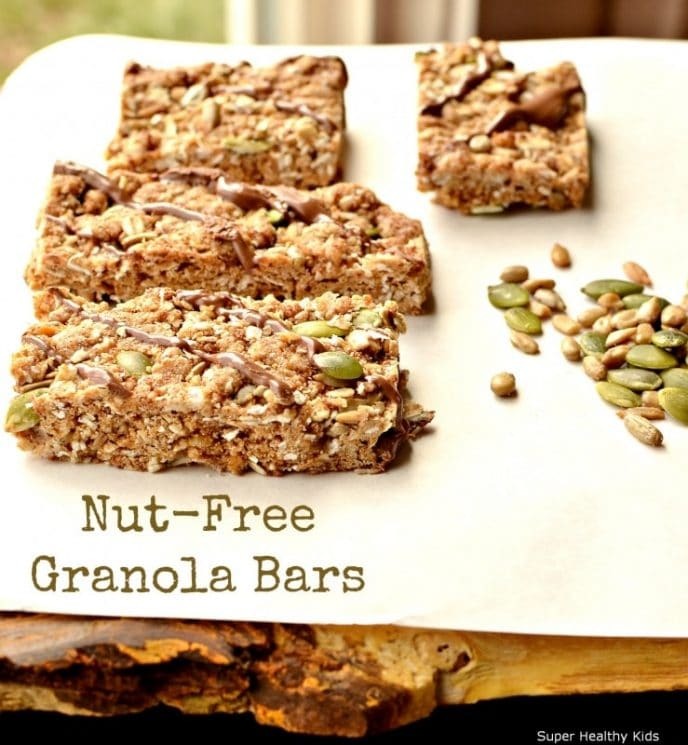 The Center for Diesease Control lists coconut as a tree nut, so this is NOT a nut free recipe. Your allergist can advise you if your child should stay away from coconut as well as other tree nuts. Thanks for the heads up Nan! For sure, check with your physician. Although the FDA has labeled it as a nut, botanically, a coconut is a fruit so, most people who are allergic to tree nuts can safely eat coconut. how much time does this take to cook? SO good. I thought it would need a little chocolate on the top, but it is plenty sweet as it is. Made my house smell like apple pie when I was baking! Way way way too sweet! Sweeter than chocolate chip cookies ! I make them using honey and only 2 tablespoons of the sugar. Next batch I will try no sweetener except for the honey. I use flax seed instead of the seeds. 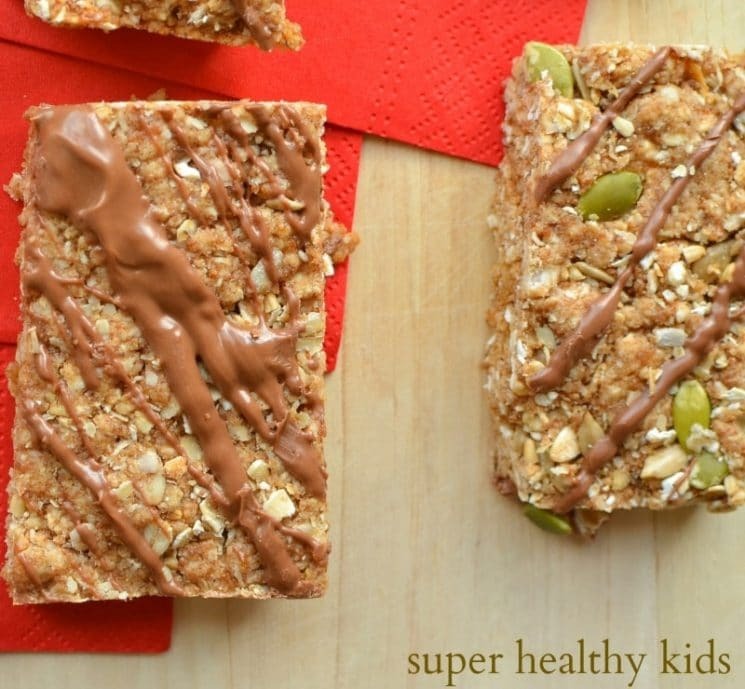 These are great for the kids once nearly all of the coconut sugar is removed!!! I am happy I found it! I just finished making these. I doubled the recipe and yes, they were very dry and crumbly before baking, I had my doubts. They turned out amazing! I don’t think they are going to last more than a day. Excellent recipe!! I had tried a no bake recipe before and it fell apart, so I had low expectations, but they taste great and the texture is great. Will make again for sure!